I found this exercise very challenging as I could not seem to capture any details in the seconds it took for people to walk by. In the end I gave up and worked from a photograph that I took of the town seen. In looking at others artists approach to the moving figure, I really liked this drawing of the business men rushing to work , seemingly oblivious to their surroundings which the artist has only hinted at. I decided to experiment by reversing this idea with the buildings and stationary structures given the colour and solidity compared to the vaguer outlines of the passers by. However it is difficult to see the people’s outline amongst all the colour. I know the exercise wanted us to recapture the colour of the day but I don’t think that has worked here. The support is wrong for a grey cold day and the chalk doesn’t work with the coloured pen. 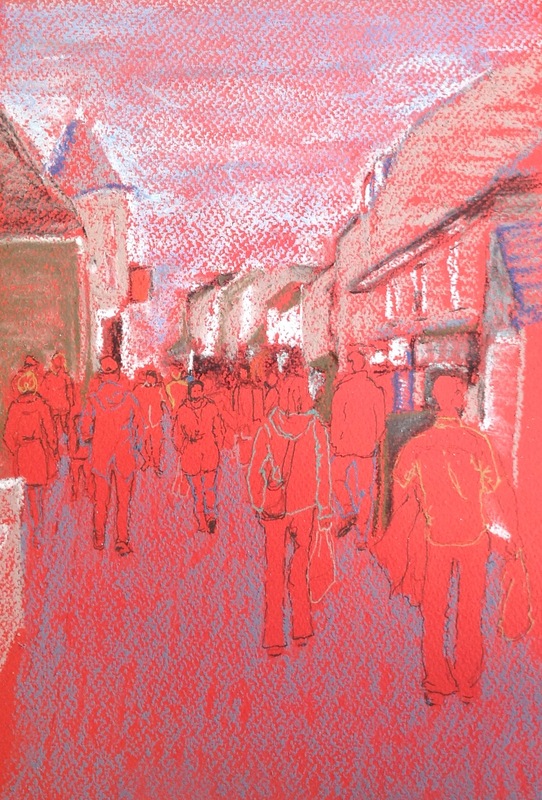 I think that I have captured something of the moving crowd of shoppers. I found some useful advice from a site called ‘Urban Sketchers’, that suggested if you wait awhile someone else will come along in a similar position, so you might end up drawing the legs of one person and the top half of another! Hi Kate I totally agree. It was a brave ideas and I think it really came off! Thanks so much, I need more practice with moving figures I think…quite a challenge.